We get pretty opinionated when we talk about table saws and laws dealing with mandatory technologies, so this article, though based on a recent move by the CPSC to address the problem of table saw safety and SawStop technology in particular, is going under our “Editorial” category. We’re all about safety. We love safety. And the statistics (though the study is not cited) that show there are an average of 10 finger amputations per day due to consumer use of table saws just wrecks us. I mean, that’s a lot of damage and certainly something that would be good to address. Here’s our problem: Nearly all of the motion in this new direction of forcing manufacturers to come up with a solution seems to have been driven, in one respect or another, by patent-attorney-turned-inventor Stephen Gass, inventor of the SawStop table saw, a device which uses capacitance measuring technology to stop a saw blade before it damages a finger. It’s a brilliant device – but it’s, as you imagine, patented out the wazoo. That means that there’s no way for other manufacturers to make similar technology without paying Gass lots of money in licensing fees and forcing the cost of a typical table saw to rise by upwards of $100 per unit… among other things. On top of that there is the fear of false positives. After all, replacement parts are expensive, and what consumer is going to want to spend an additional $60 – $89 to have another replacement cartridge handy? Some portable table saws cost about that much. SawStop will argue that false positives are rare and that the system is smart enough to know the difference between wood that conducts a circuit to the blade and flesh. That has yet to be satisfactorily proven and it certainly hasn’t been considered in light of a nationwide, mandated roll-out where the numbers of saws goes up exponentially. Law of Unintended Consequences – the End of the Table Saw as We Know It? The Consumer Product Safety Commission is a valuable, but potentially scary, organization. While it does a lot of good for consumers, there is a lot of potential for them to all but shut down the entry-level table saw market with a bad ruling. And has anyone wondered why the development of new table saws all but died for over two years, even with the new UL 2010 requirements? Seriously, take a look at how many manufacturers are selling existing table saws instead of redesigning new ones. Our contention is that the manufacturers are likely in a “wait-and-see” mode caused by the potential for huge regulations and new requirements that will drive up costs and take a lot of consumers away from being able to avoid this type of tool. Additionally, there is a concern that once the cat is out of the bag, so to speak, all bets are off. Once, for example, DeWalt, Ridgid, Craftsman or Bosch makes a saw with SawStop technology built in, they are completely opening themselves up for liability on saws that don’t feature the technology. We live in such a litigious society now that concerns like this are very real. And personal responsibility has gone out the window, at least in terms of judicial cases, in the past couple decades. If a woman can sue McDonald’s for spilling her own hot coffee on her lap and win, how many lawsuits do you think the table saw industry will face for improper use of a table saw? Another concern is laziness and bad habit-building. 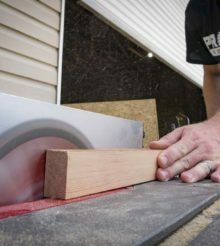 If SawStop-like technology is rolled out industry-wide, people will begin to feel a lot safer about their table saws. This will, invariably, cause them to do stupid things they wouldn’t do with their existing saws. Once that happens, it will be interesting to see if the number of accidents doesn’t, in fact, go up. What happens when an entire industry full of people suddenly gets lax about how they treat a very dangerous tool? What happens when a tool fails to function as advertised? Comparatively speaking, there are hardly any SawStop saws in the marketplace… What is the potential for lawsuits when the industry is covered in them and everyone expects 100% successful operation (something that is impossible to achieve)? What about other types of circular saws? Won’t lawsuits inevitably force this technology on circular saws? Miter saws? Chop Saws? Reciprocating saws? How long until we are forced to pay more for all of these tools – and as a result are prevented from acquiring inexpensive tools to do simple tasks. What happens to the DIY market then? All of these issues should be carefully considered when making any sort of binding ruling on the industry. voluntary rulemaking. The problem is – nobody can do it with all the patents locked up. Gass even has the device technology patented in China, Australia, India and Taiwan. We agree that price is nothing to someone who’s lost a finger in an accident. But is mandating technology the answer? Or is mandating this type of technology actually dangerous to the market and subject to a whole host of unintended consequences that we can’t yet fully see? Hit the link below and comment in our forums to let us know what you think!